As you may know, a few years ago my family and I radically changed our eating habits. We cut “meat with feet” out of our diet and now eat a mostly vegetarian diet plus fish and eggs. The funny thing is this: I haven’t missed hamburgers one little bit. Well…except once. 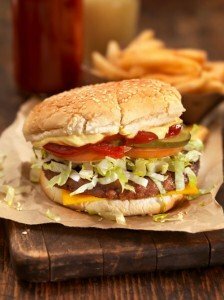 As you can imagine, there were no cheeseburger-making supplies at home in my refrigerator, and if I was going to give in to this craving, it was going to have to be with a really good cheeseburger. In other words, this craving could not be satisfied with the kind of cheeseburger you could get your hands on after 8 PM while wearing sweat-soaked running clothes. And so, vegetarian fare won out. Fast forward to the next Monday night, when my daughter invited a few friends over for a cookout and a sleepover. The menu that night included 100% beef hotdogs. I looked for some meat-free options while shopping, but the store we went to that night didn’t have any. I figured I would get by on side dishes and call it done. But, having never satisfied my hamburger craving from a few days prior, the hotdogs looked amazing! And so…I had a hotdog. I topped it with onions, pickle relish, ketchup and mustard, and savored every single bite. It’s okay if you veer off track. The road to our goals is never a straight path. And that’s okay. The trick is to know this and then simply get back on track. Here’s what I mean. Maybe you need a break from your big organizing project. No worries. Give yourself the rest you need and get back on track when you’re feeling rested. Maybe you forgot to use your new paperwork system for a few days…and the piles have started to return. No problem! Simply start using your system again today. Pick up where you left off and keep moving forward. Perhaps you set a goal to lose a pound a week…but last week you gained a pound. That’s okay! Stop beating yourself up and get back on track this week. Try to figure out what you can do differently this week to create the outcome you want. Good advice. I tend to ebb and flow in and out of my goals. I’m usually happy if I’m at least heading in the right direction. I got off track this week. This is the first time my house has been this messy in at least 10 months. I relaxed a bit but now wonder if I caused anything to happen I might regret. I don’t normally feel overwhelmed but I can see that leaving things go can bring a feeling of over-whelm. Lynn, Thank you for your comments. Your sentence beginning with “Many…..” really resonated with me. I’m ready to get back on track! Thank you for your comments, Lynne. I think what you said here is so true: Many of us spend too much energy being upset instead of just getting back on track. Abby, Thanks so much for this message. I’ve gotten off track with my June goals. I will get back on track today by taking one small step forward on 3 of them. Good for you Linda! 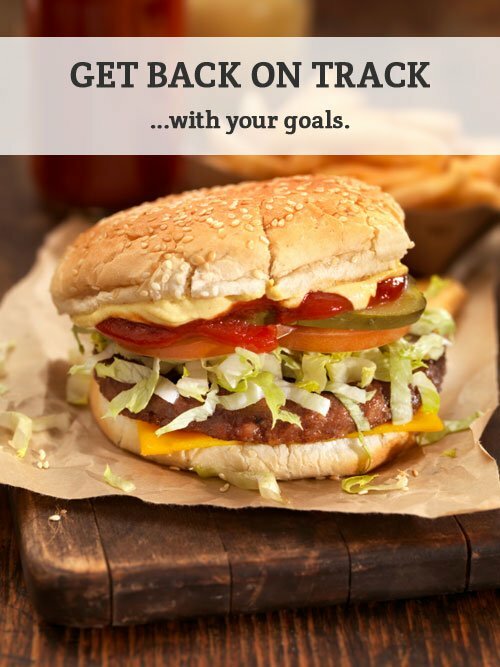 So glad to hear I inspired you to get back on track with your goals! One small step forward is what it takes to get heading in the right direction again.